Service Box & Tape offers amazing deals on the supplies you need to pack and protect with confidence. Specialty moving boxes for wardrobe, dishes and artwork. Unbeatable prices on bubble, newsprint and moving blankets. We can even deliver to your home for oders over $300. Are You A Commercial Mover? 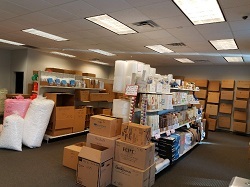 Our massive inventory of moving supplies, three convenient warehouse locations and incredible prices on overstock boxes make Service Box & Tape the go-to resource for commercial movers in Atlanta. Please call 404-756-8400 for a quote on bulk-quantity purchases.